Poetry and ingenuity, when in unison, are capable of creating extra- ordinary wonders. The harp is such a wonder. The exhibition entitled: “The evolution of the harp: the origins, Sébastien Erard, Victor Salvi”, pays due homage to this marvellous instrument. 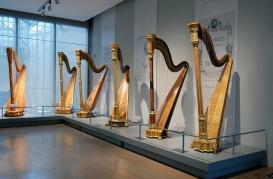 On display is a series of unique instruments selected with strict philological criteria, to illustrate the development of the harp in the world from antiquity. The focus is on the creative genius of Sébastien Erard and Victor Salvi: the former as the inventor of the double-movement harp, that revolutionized how the harp is played. The latter as his worthy heir in his capacity to anticipate and interpret the evolution of the instrument, combining passion, drive for research and engineeting skills.” The exhibition lasts three years: it was opened in 2011 and will last until 2014. The Museo dell’Arpa Victor Salvi boasts this prestigious classification: the only museum dedicated to this instrument. This challenge was launched at the 28th of January 2006, the day of its inauguration, with the first exhibtion lasting until 28 January 26. The museum, built to house, on a rotating basis, the collection of more than 100 antique harps inspired by Victor Salvi, is today an international landmark not only for harpists, but also for art lovers. Inside the museum is a precious collection: eighty-six instruments, the oldest of which date back to the 18th century. Thanks to the exhibition programme over these years and the programme of concerts, seminars, and initiatives for children, designed to promote the culture of the harp and its universe of sound. The oldest harps can be seen on the frescos of the Egyptian tombs. These instruments are either bowed or rectangular. The number of strings varies from five to twelve. In the Middel Ages the Irish harp, known as the Celtic harp, was played. In 1720 the single-movement harp was invented in Austria and at the end of 1811 Sébastien Érard invented the double-movement harp. The pedal harp has seven pedals. 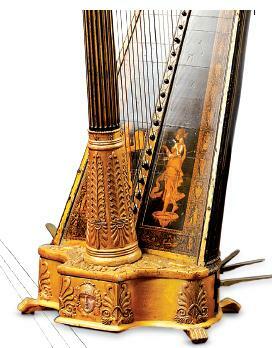 The invention of Érard made it possible to modulate all 47 strings and thus the harp became a complete instrument. The Museo dell’Arpa Victor Salvi is located in Piasco in Piemonte in the heart of the Varaita Valley in northern Italy, not far from the French border. These lands, just a few kilometres from Saluzzo (some 85 kilometres south of Turin), boast a renowned woodworking tradition. 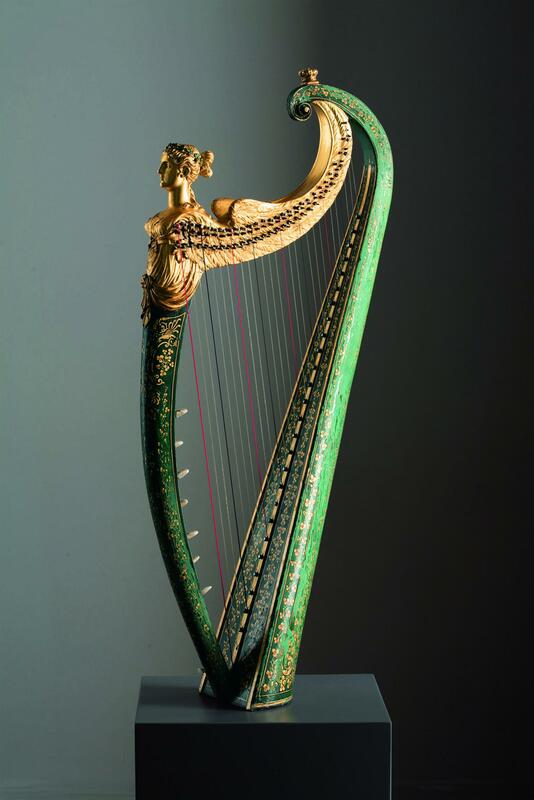 The skilled craftsmanship of these ‘maestri minusieri’ conquered the heart of Victor Salvi, who decided this was were he wanted to establish his firm: Salvi Harps. In Valle Varaita, the excellence of human know-how iadn craftmanship is combined with the beauty of nature. The fascinating story of the musical Salvi family starts in Venice with Antonio Salvi (1893-1983), the great-uncle of Victor Salvi. The legacy of the Salvi family is both musical and mechanical, talents that engaged several members in playing, designing, engineering musical instruments, especially the harp. Antonio Salvi owned an instrument factory that imported and sold German pianos and a few harps. Antonio’s wife was a harpist. Rodolfo Salvi, the father of Alberto, Aida and Victor, was raised by his uncle Antonio and his wife. Rodolfo grew up as a child in and around the factory of his unce. During his apprenticeship in his uncle’s firm, Rodolfo met many great artists, like Franz Liszt and Richard Wagner. Rodolfo’s experience gradually grew and so did his fame. He designed and constructed a string bass and played the instrument at the Teatro della Fenice. Rodolfo married Giovanna Toso in Venice in 1891, and his first son Alberto was born 2 years later. But the mother Giovanna was a victim of the great plague of that time: tuberculosis. The only treatment at that time was high altitude and dry air, so Rodolfo Salvi took his family to the Apennines to the village of Viggiano, which was populated with musicians, of which 10 per cent were harpists. Viggiano, a small town in the south of Italy, renowned for the construction of harps. Rodolfo proved to be a first-class instrument maker and built violins and other stringed instruments and pianos. His wife Giovanna unfortunately died in 1899. On the 4th March 1920 Victor was born in Chicago. Victor Salvi appeared to be a performer, an excellent harpist, and an engineer as well. Harp designer Victor Salvi was far ahead of his time. By high school age his repertoire included all the standard classics from Bochsa and Dizi through Händel to Zabel and Debussy. Later Victor became curious about the mechanics of the harp. He succeeded in finding new possibilities for improvement. Because his urge to repair and even build and improve the exsisting harps, he set up a shop in Chicago and began a harp repair business. He was already an established harpist in the 50s, plaing for the New Yok Philharmonic Orchestra and the NBC Orchestra. By that time he opened his first harp entreprise in New York City in a small shop. 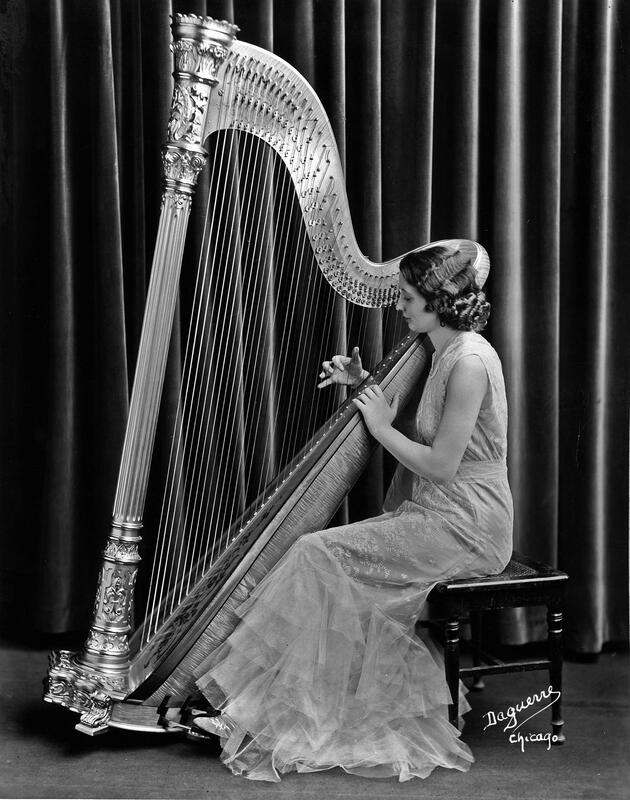 In 1954 he built his first harp with the help of various craftsmen. They wanted to build a harp that had not been built until that moment and which had the greatest sound quality. 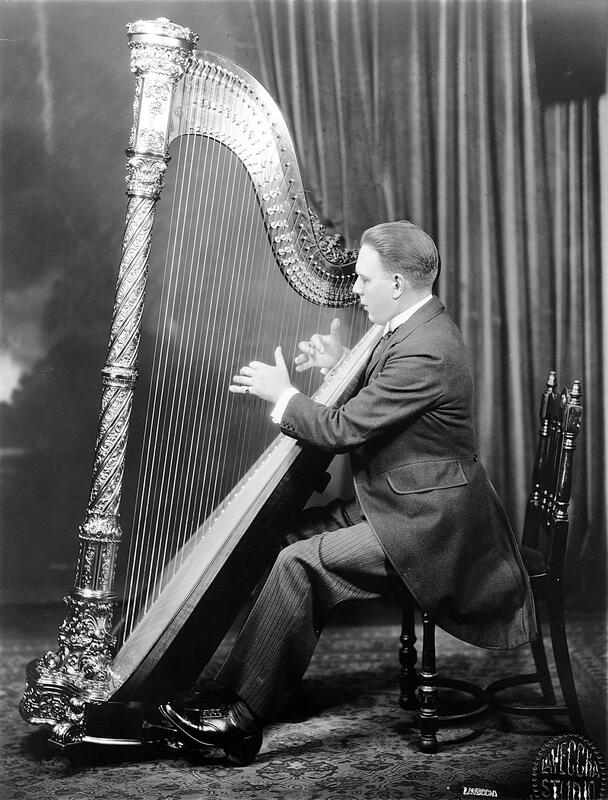 Victor had spent years studying new methods and techniques to improve the harp. 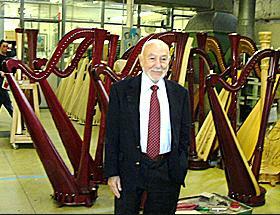 In 1956 Victor moved to Italy, his land of origin, and established a harp business in Genova. 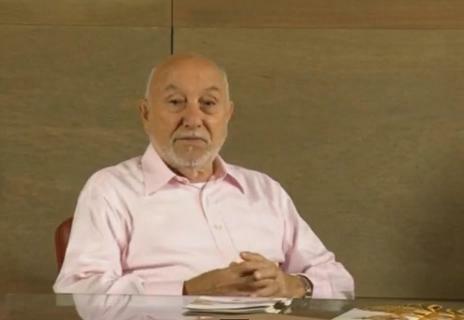 In 1974, he moved the business to Piasco, in the Saluzzo area, known for the skill of its wood craftsmen, where he opened a factory in a former wild cotton mill. 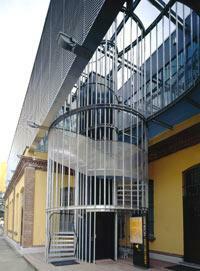 In 2006 his museum, situated above the fabric, was opened. War I a lot of Italians emigrated to the USA, and so did Rodolfo to start a new life. He went to Chicago where he started to work for the Kimball Piano Company. Alberto’s solo performances in the USA were outstanding. Aida Salvi (photo right), Victor’s elder and only sister was a professional harpist too. She played with with the Chicago Opera house. She was more of a composer than a performer. Aida Salvi taught Victor to play the harp. 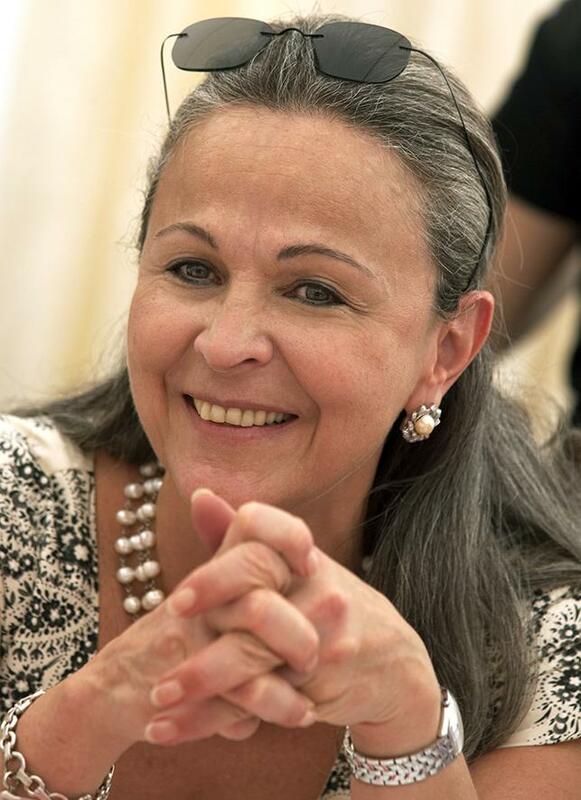 Julia Salvi, Victor Salvi's Colombian wife, is the president of the Victor Salvi Museum and the Foundation. The Victor Salvi Foundation is very involved socially, undertaking cultural, promotional and supportive activities to encourage harpists and publicise the world of harp music. Julia opened in 2006 the museum in the name of her husband. She and General Manager Roberta Scarzello plan all its operations, with the well-known French architect/museum expert Didier Blin also playing an active part. Blin designed the entire interior of the museum and also designs the exhibitions. One of the Salvi Foundation's activities is its support of the triennial Lily Laskine International Harp Competition in Paris, with which the Foundation has been involved since 2000. The Lily Laskine Competition has been founded by Bertile Fournier, who unfortunately died in 2011. She founded the competition with the support of the city of Dauville and Salvi Harps as a sponsor. Then, when the Salvi Foundation was established in 2000, it became the most important sponsor of the Lily Laskine Competition. Besides giving financial support, the Foundation also donates two harps: one especially made (Minerva) for the senior harpists and a second one (Daphne) for the junior harpists.